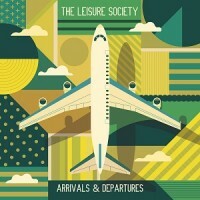 On the 10th anniversary of their first ever single (The Last of the Melting Snow), The Leisure Society release a new single entitled God Has Taken a Vacation, along with news of their fifth album, Arrivals & Departures. Speaking of the release of the new single, their highly-lauded songwriter Nick Hemming said: "I started writing the song about my break up, but world events started finding their way in too. Division, borders, a loss of hope. There were a lot of shared themes!” During the promotion of the band’s previous LP, The Fine Art of Hanging On, Nick and their flautist Helen Whitaker went through a long process of separation, ultimately resulting in Nick moving out of their Brighton home. This displacement set the tone for the next 18 months, as Nick moved from one temporary accommodation to the next, writing and recording demos constantly as he came to terms with the break up - which would eventually become the foundation of their upcoming fifth full length album, Arrivals & Departures.